We were asked earlier this week if the claim that Macon has 300,000 cherry blossom trees is true; and if this claim had been validated. Folks find it hard to believe that there are 2 cherry blossom trees for every 1 person in Macon. So, we asked William Fickling, III to share his thoughts in an effort to better substantiate this claim. The Fickling Family has donated cherry trees since 1979, which is about 365,000, or about 10,000 per year. Some years were more, and some were less, but that's the average. 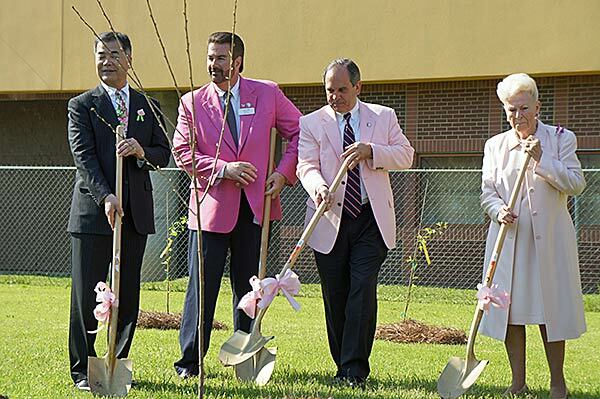 Also, William Fickling, Sr. began giving away trees in the early 1950's, well before Keep Macon Bibb Beautiful, or the Cherry Blossom Festival began. But those trees are not included in the count, only the trees that were donated since 1979 are included in the count. The survival rate of the cuttings is only about 50% in the first two years. That's when the cuttings are most likely to perish, unless they are watered every two weeks during their first two summers. For instance, William Fickling, Sr. and Carolyn Crayton donated enough trees for the GA State Dept. of Transportation to plant cherry trees at every intersection between Macon and the Atlanta Airport on I-75, however, because most were not properly watered, many of them perished. The ones actually on the airport property survived until this past year, when many of them were cut down due to the remodeling, because the airport staff kept them watered quite well. But of the 365,000 donated overall, probably only about half (182,000) survived beyond their first two years into maturity, i.e., the ones we see now. The average life span of a cherry tree in Macon in USDA Zone 8 is about 25 years. 182,000 divided by 25 is about 7,000 trees a year on average that need to be replaced. Some live longer (up to 50 years at the Fickling residence), and some shorter (mostly lost during the first two years). But over the 66 year period since William Fickling, Sr. began giving them away, the Fickling's would have had to replace each tree that lived to maturity about 2.64 times, just to replace the ones that died. So some of the apparent discrepancy is due to the relatively short life span of the trees in Zone 8. For instance, every year the City replaces the dead trees in Third Street Park. You may notice that the majority of them are quite young now, because they have all been replaced, some of them 3 or 4 times. Fickling has counted over 150 trees in his front yard, but gave up after that, because he has 7 acres on Ingleside Ave. packed with trees. Fickling suspects he has three times that many in his entire yard. Same for Fickling Farm, and Wesleyan Woods. Yet, most yards throughout Macon only have one or two trees. Since the cherry trees are more "showy" when planted en masse, it's easy to miss them when planted individually, but they are there if you look closely around town. Remember, 7,000 to 10,000 of them every year are small and easy to miss, especially since they don't usually bloom the first few years.